Created Joomla based websites for non-profit clients. Maintained and updated Drupal and WordPress sites. Built websites from Photoshop documents provided by clients. Worked collaboratively with clients to create effective websites from client concepts. Maintaining computer systems and network security. Implemented secure, offsite backup system. Updated school website including front page calendar and internal Coursepages for students. Implemented Google Apps for Education. Taught 1st and 4th grades in inclusive general education classroom. Managed between 24 and 27 students with a wide range of abilities. Created lessons to incorporate use of handheld computers at multiple grade levels. Provided support and training for employees and clients. 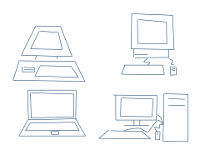 Administered client and server Windows and Macintosh computer systems. Researched, budgeted, purchased and installed computer hardware and software. Assisted customers with technical problems and answered product questions. Produced photo shoots in the studio and on location for national advertisements. Designed and programmed Studio Gallery web site. Administered and maintained Unix, Windows and Macintosh network. Created and updated intranet website content. Production Coordinator for Secret Paths in the Forest, the first video game for girls. Supported students and teachers in Commodore 64 computing environment. Programmed and instructed in LOGO and BASIC. Bicycling, canoeing, juggling and setting up Hot Wheels tracks and Lego towns with my four-year old son.